Rome in the spring is magical. It is my favorite time to be there. 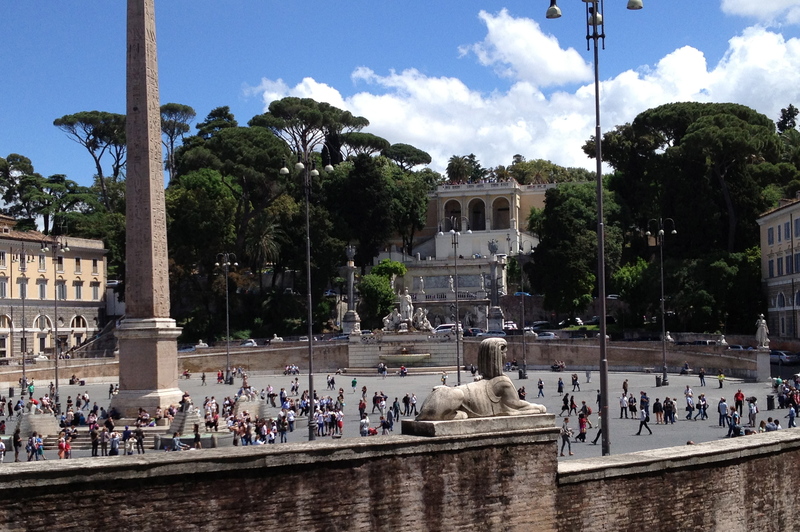 Michele and I were spending a week in Sorrento and what better way to begin and end our travels than in Rome. The days were becoming warmer and longer and just walking around the city and taking in the sites was a pleasure. Looking at the official seal of Rome, SPQR meaning ‘The Senate and the People of Rome,’ always reminds me that Rome was once the most important city in the world. We sat in the outdoor cafes on sunny mornings enjoying cappuccino and cornetti and watching the world go by. At night we would stop for a Campari and soda or a Negroni at one of the roof garden bars watching the setting sun. 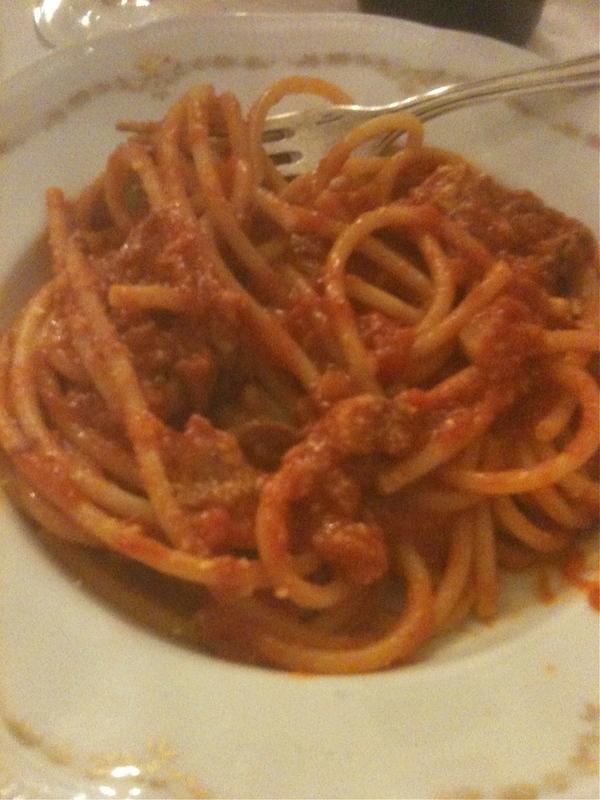 But as I have said before, I love the food in Rome and the highlights of the day for me are lunch and dinner. Here are some favorite restaurants we went to on this trip. Some we have only been to a few times, others we have been going to for over 30 years. We decided this year to give the restaurant another chance. On our way there, Michele said, “Let’s ask to sit inside because that is where all the Romans are.” When we arrived the owner offered us a table outside but we insisted on inside. After moving a few tables around, we were seated. The restaurant filled up very quickly and Romans sat at every table inside. Our waiter was very good considering it was a busy Sunday afternoon. He only spoke to us in Italian which we preferred. As usual, I ordered zucchini flowers (I cannot get enough of them) to start. These were perfectly deep fried with a small amount of mozzarella filling and more than a hint of anchovies. 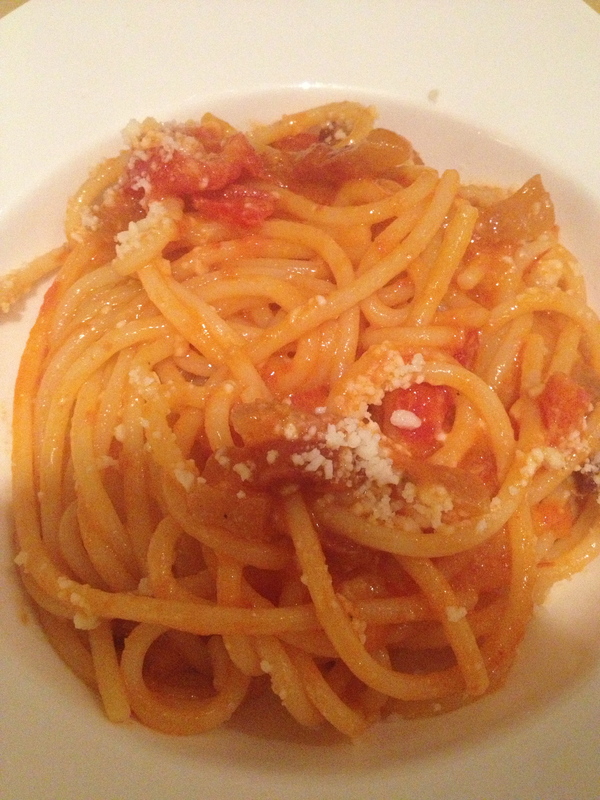 I ordered the bucatini all’Amatriciana. 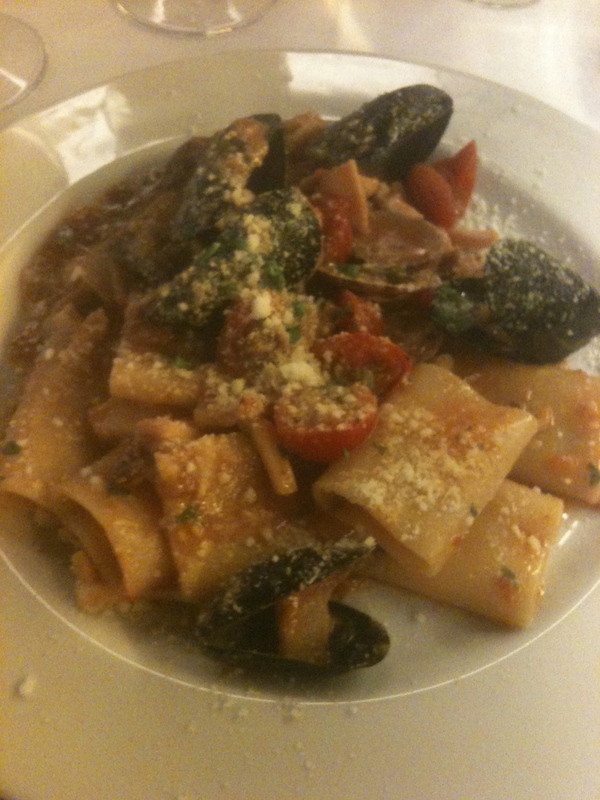 Along with one or two others, this is one of the classic Roman pastas. Some places serve it with rigatoni but it is not the same. Then I had abbacchio (baby lamb) roasted with potatoes. It was cooked to perfection, moist with crisp skin. 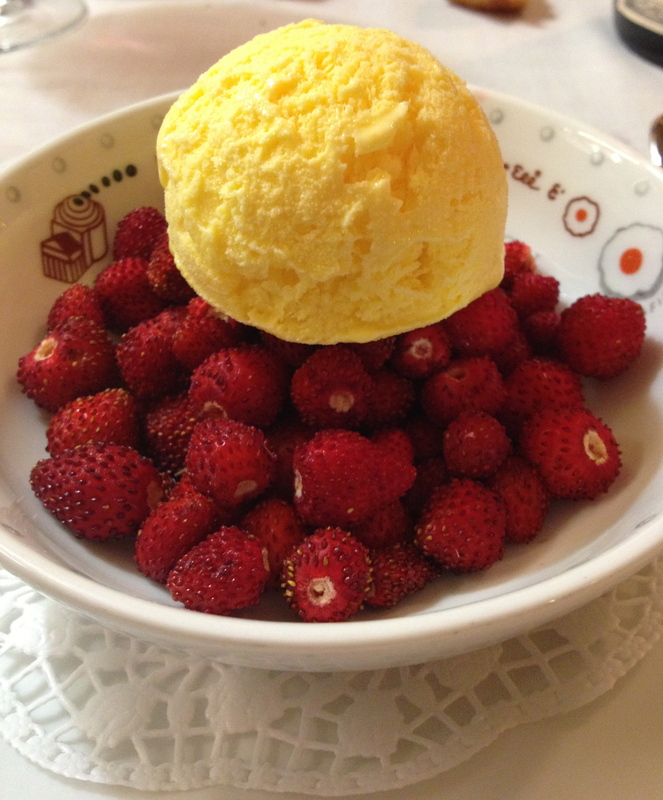 For dessert I had tiny fragoline, wild strawberries, and gelato. Michele loves fragoline and orders them every chance she gets. 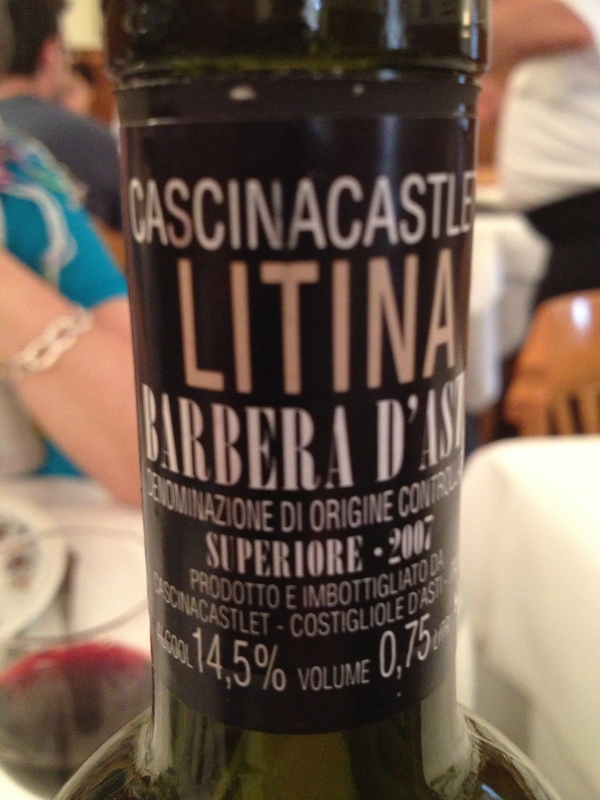 The Barbera “Latina” 2007 from Cascina Castlet went very well with the pasta and the baby lamb. The restaurant had returned to form and produced the perfect traditional Roman meal. I was very happy. Last year we went to restaurant Armando al Pantheon, Salita de Crescenzi, 3906 68880 3034, for the first time and liked it so much that we decided to go again this year. Michele made a reservation on line and when we arrived in Rome we confirmed the reservation just to make sure. This is also a traditional Roman restaurant. 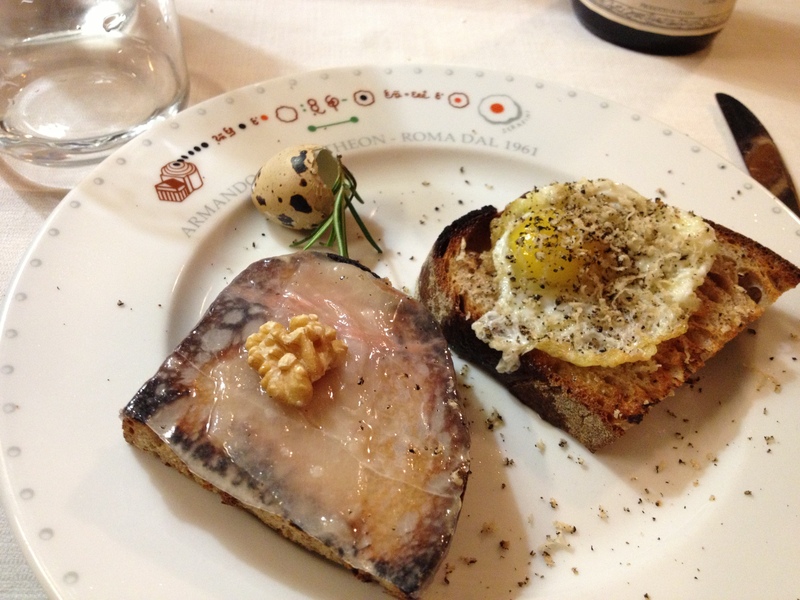 We ordered crostini with truffles and quail egg, bucatini all’Amatriciana and grilled lamb. Once again we had the fragoline with gelato for dessert. Michele really likes the food here. 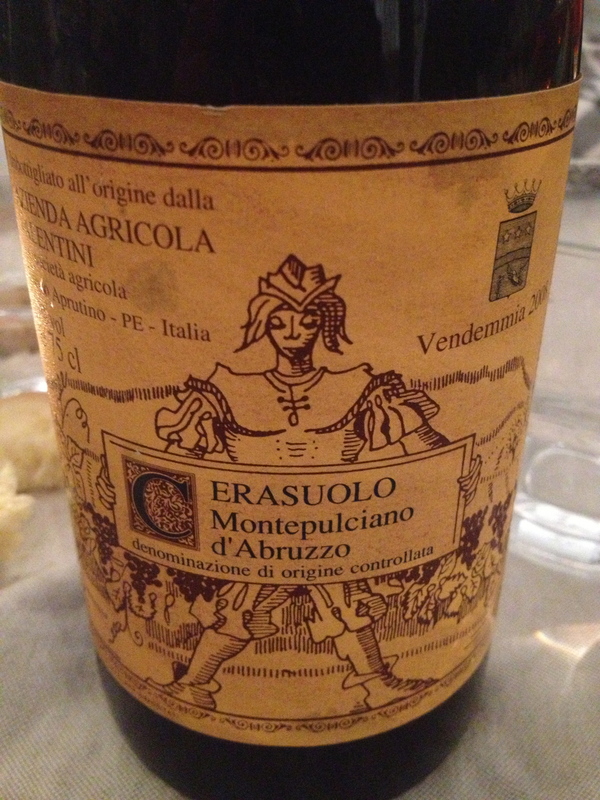 The wine was the 2009 Montepulciano D’Abruzza, from Emidio Pepe. At less than 40 euro, it was a real bargain in a restaurant. The wine was big but with a lot of fruit and not as tannic as I expected. I should have asked them to decant the wine. Most of my experience with this wine has been with vintages that are 25 years and older. Roscioli Salumeria Vineria con Cucina – Via dei Giubbonari 21-22. This is not only a restaurant but also a salumeria, a shop specializing in salumi and cheese. Michele likes the restaurant because it has the best spaghetti carbonara in Rome. It can also be very creative with items like the hamburger di bufala with grilled ham and a balsamic drizzle, and the burrata e alici. This time we both ordered the carbonara. Michele is right, it was terrific. The wine was the 2008 Cerasuolo (Rosè) 100% Montepulciano d’Abuzzo from Eduardo Valentini. I believe it is Italy’s best Rosè and it was less than 40 Euro. Da Giggetto (39- 066861 105) at Portico D’Ottavia 12 A, in the Jewish ghetto. It was a chilly and cloudy afternoon in Rome as we made our way to the restaurant. We sat inside in one of the small rooms that look onto the street. I do not need to look at the menu because I always order the same things: fiori di zucca ripieni con mozzarella e alici (small and crunchy but very good), carciofi alla giudia (fried artichokes) and spaghetti con vongole veraci. The clams were small and tender with just the right amount of parsley, garlic, olive oil and a hint of hot pepper. Michele had fava beans with guanciale. We have been going here for many years and have never been disappointed. Palatium- Enoteca Regionale Via Fattina 94 39-06-6920 2132. 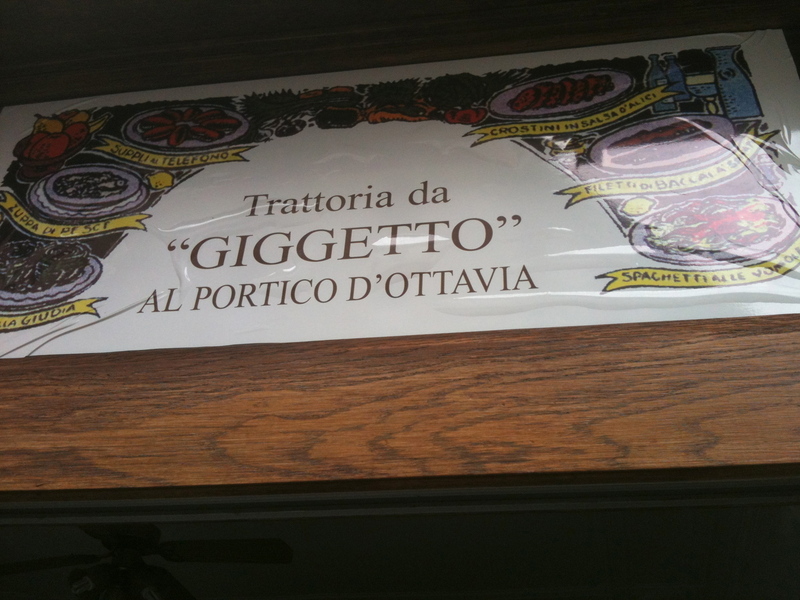 This is a restaurant run by the region of Lazio. All of the food is typical of the region. The wine is only from the region and a real bargain as most of them are between 10 and 14 euros. There is a very large selection. The restaurant was a few doors down from our hotel on the Via Frattina and as luck would have it we went there on the night that it rained. I had cacio e pepe which is a typical Roman dish and Michele had mozzarella in carrozza, a very large toasted sandwich. 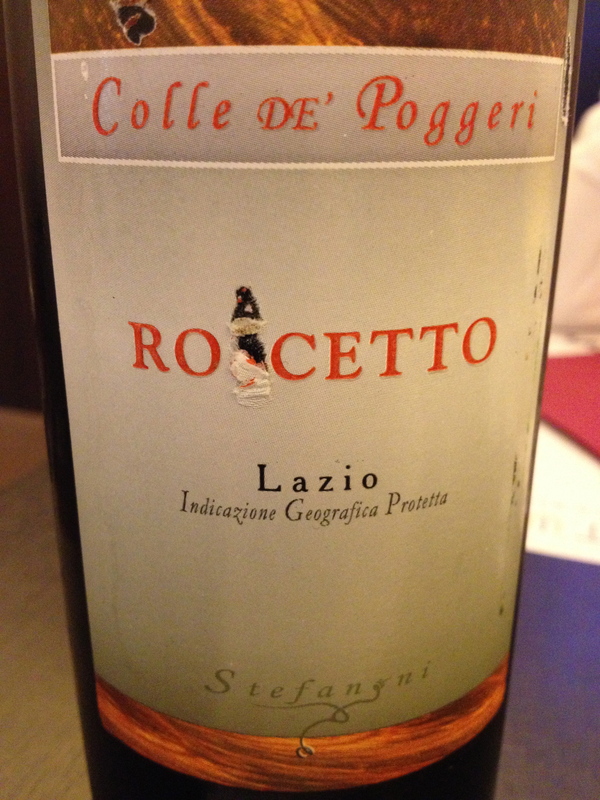 We drank a bottle of Lazio I.G.P “Colle DE” Poggeri” 2011 from Cantina Stefanoni 100% Roscetto (Trebbiano Giallo). The harvest took place from 10 to 15 of October. Fermentation is on the skins for about 12 hours. The must fermentation is in wooden barrels for about two months. The color was yellow with golden reflections and the wine looked like it might have oxidized. This was not the case; it was fresh, soft and well balanced with good fruit aromas and flavors. It is a bargain at 10 euros. If I were a rich man I would have and apartment in Rome and a house on the Amalfi Coast. While I cannot buy a house on the Amalfi coast, I can rent one for a vacation and on the way, why not spend a few days in Rome? We always go to the same place for lunch when we arrive in Rome. We drop off our bags and walk to Da Giggetto(39-066861 05) at Portico D’Ottavia 12A, in the Jewish ghetto. The afternoon was sunny and too hot to dine outside so we sat in a newly opened room with big glass windows onto the Portico D’Ottavia and the synagogue. I do not need to look at the menu because I always order the same things: fiori di zucca ripieni con mozzarella e alici The flowers were small and crunchy and very good. 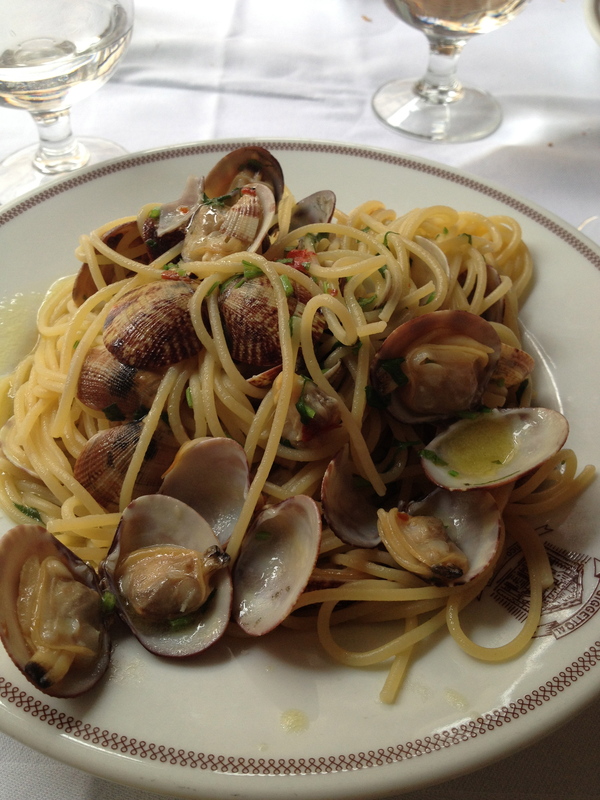 I also get carciofi alla giudia (fried artichokes) and spaghetti con vongole veraci. The tiny clams were tender and seasoned with just the right amount of parsley, garlic, olive oil and a hint of hot pepper. Michele had il filetto di baccala (she loves the way the Romans fry) and the puntarelle in salsa d’ alici, her favorite salad, a type of chicory. It was a relaxing start to our trip. For a number of years now we have been trying to go restaurant Armando al Pantheon but somehow never get there because it is always booked up. This time, Michele made a reservation on line from NYC. 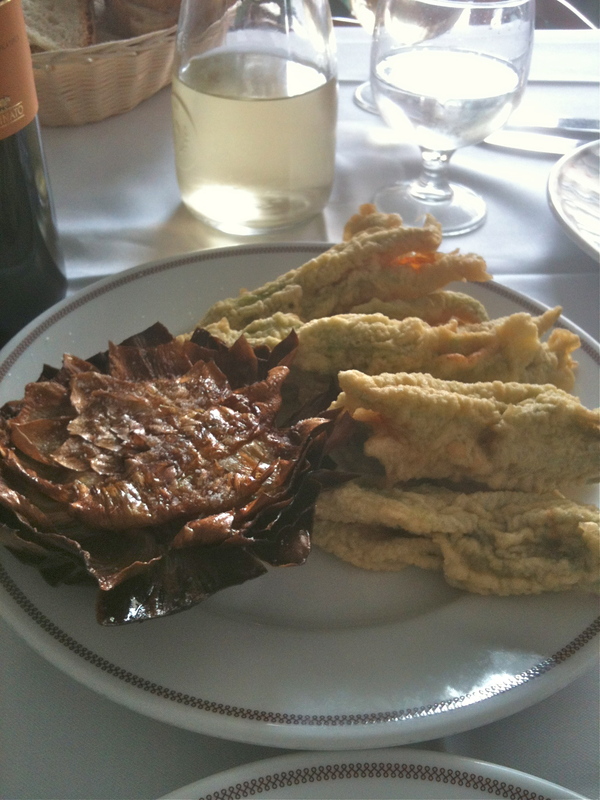 We started off with what I always order in a traditional Roman restaurant: zucchini flowers, bucatini alla matriciana and abbacchio arrosto. The dessert was a strawberry crostata with a lattice top. Michele really loved the food here. 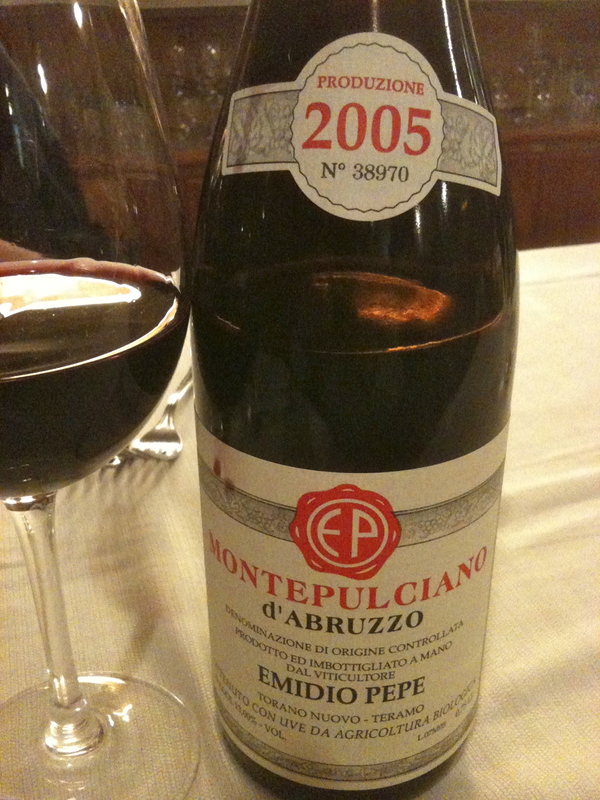 The wine was the 2005 Montepulciano D’Abruzza, from Emidio Pepeit was less than 40 euro–a real bargain in a restaurant. The wine was big but with a lot of fruit and not as tannic as I would have expected. Most of my experiences with these wines are ones that are 25 years and older. The wine prices in Rome, especially for non-local wines, were better than on the Amalfi coast. At Checchino dal 1887 V (www.checchino1887.com), Via Monte 30 Testaccio, Francesco Mariani takes care of the front of the house while his brother Elio is in the kitchen. A number of years ago Francesco did us a big favor by getting us on a train to Genoa during a train strike. Aside from that, it is in my opinion that with over six hundred wines from Italy and all over the world, this is the best restaurant in Rome for both wine and food. I always have long conversations with Francesco about Italian wine and which wine I should order with what I am eating. Every time I go, Francesco remembers the wine I ordered the last time I was there. This time he recommended a wine from Lazio, Cesanese del Piglio 2005 DOC from Azienda Agricola Marcella Guliano. They no longer have any Fiorano Rosso or older vintages of Colle Picchione “Vigna dal Vassallo”. They still have a number of vintages of the Fiorano Bianco, but serve it as a dessert wine. Once again I ordered the tasting menu because it had all of my favorite foods. I started with a tortino of eggs, peppers and tomato; this was followed by pasta alla Matriciana (yes again). It could not have been better. Then rabbit (coniglio alla olive di Gaeta con rughetta and pomodoro) followed by torta de mele (apple tart). Checchino is still a member of L’ Unione di Ristoranti del Buon Ricordo, a group of restaurants that give you a plate if you order their signature dish or tasting menu. Since we both ordered the tasting menu we were given two plates. We have almost 100 of these plates and eight are from Checchino. Pierliugi(39-06-6861 302) Michele loves to sit al fresco at this seafood restaurant, which is in the charming Piazza dè Ricci but it was close to 95 degrees so we opted to do what all the Italians were doing- -eat inside and enjoy the air conditioning. We started with the stuffed fried zucchini flowers, and then I had bocconcini di polenta con baccala, polenta bites with salt cod. 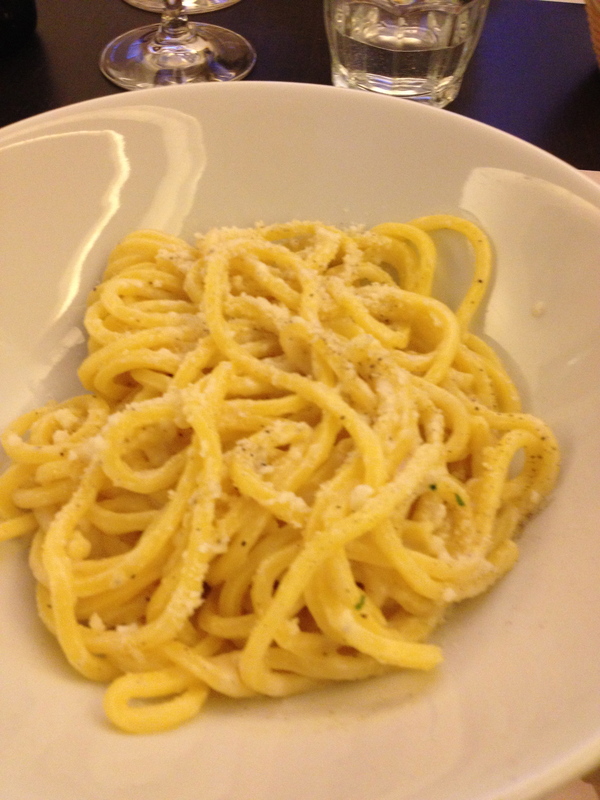 Michele had the very Roman cacio e pepe. They have their own version of pasta all’amatriciana made with paccheri, a wide pasta tube. The sauce includes shellfish and of course I had to order it. It was very good but I would have enjoyed it more if there were less pecorino cheese, which seemed a bit much for the shellfish. For the main course I had scampi (langoustine) and large shrimp on the grill. The waiter was very good and we had a long discussion about wine. 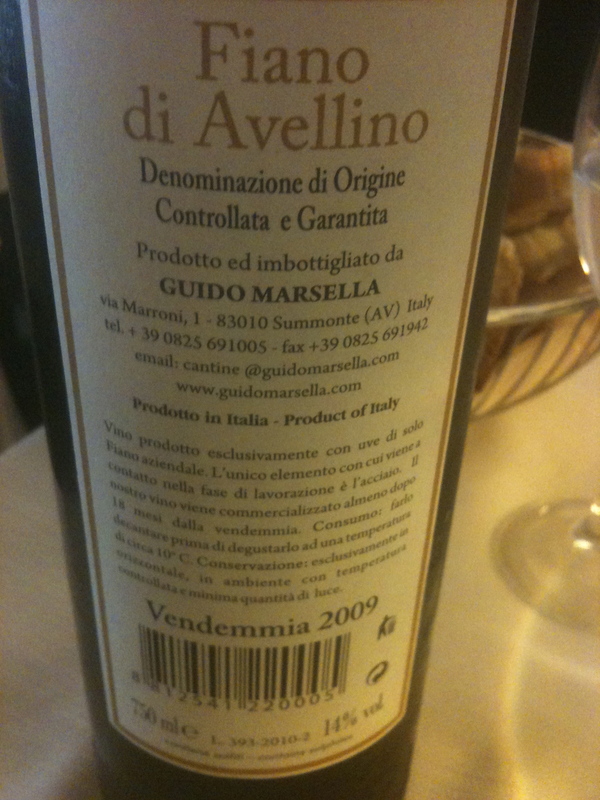 I ordered the Fiano di Avellino DOCG 2009 made from 100% Fiano from Guido Marsella. Pierluigi’s wine prices were higher than any restaurant we visited in Rome on this trip. When we told the waiter we were from NYC he told us that the owner might want to speak with us since he is opening a restaurant in Williamsburg, Brooklyn. After we finished lunch the owner, Lorenzo Lisi, came over and told us all about his plans for the new restaurant and that it would open in September. cheese. 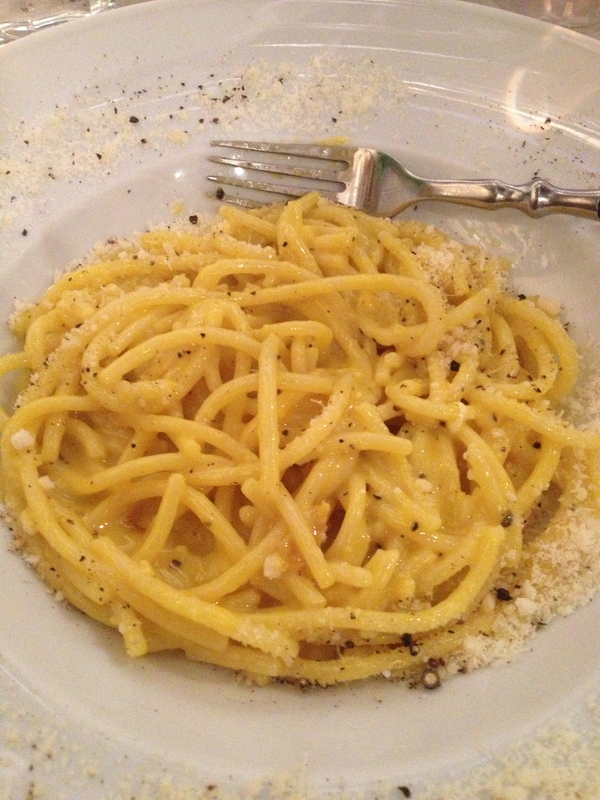 Michele likes the restaurant because she believes it has the best carbonara in Rome. 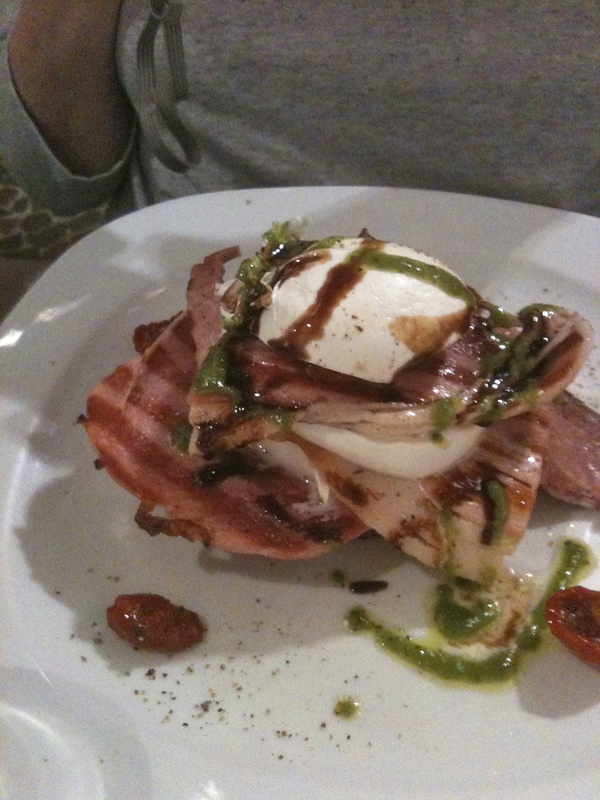 It also has some very creative items like the hamburger di bufala with grilled ham and a balsamic drizzle, and the burrata e alici, both of which we ordered along with the carbonara. 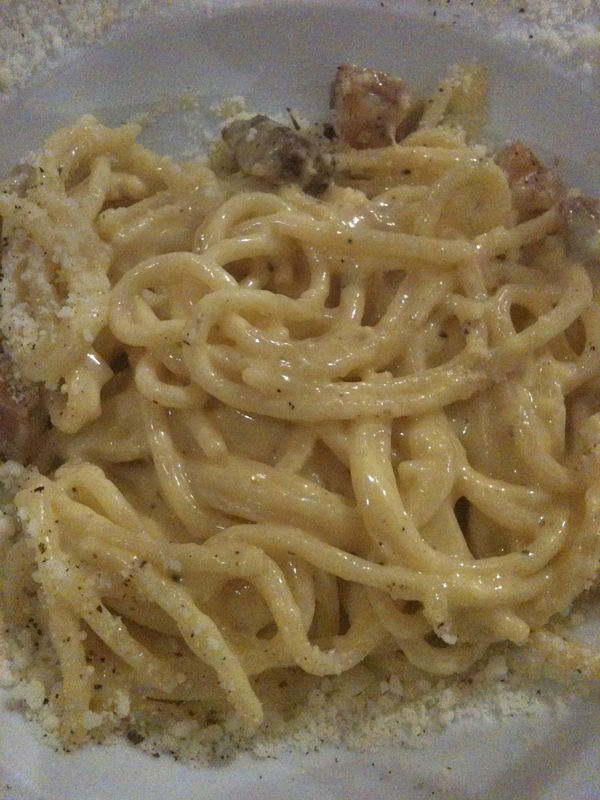 I usually order the matriciana but Michele is right, the carbonara was terrific. The wine was the 2003 Cerasuolo (Rosè) 100% Montepulciano d’Abuzzo from Eduardo Valentini. It was less than 40 Euro. 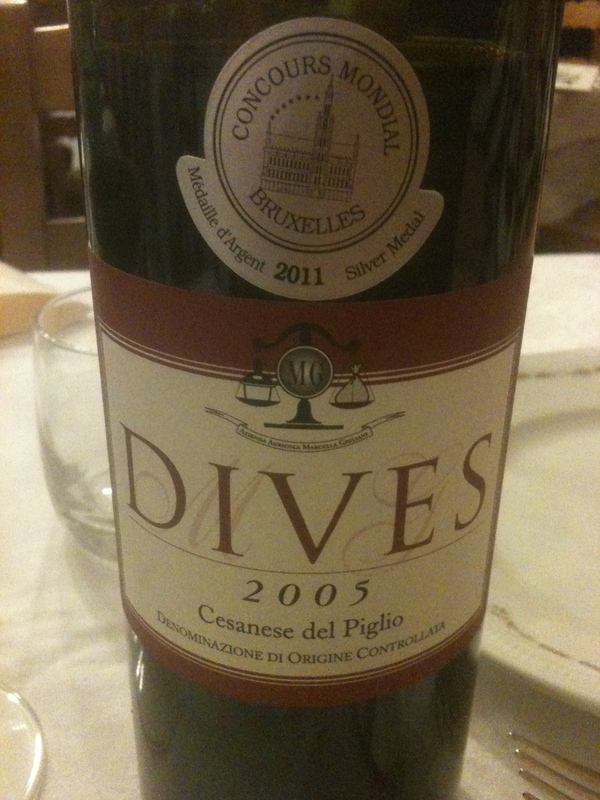 For more on Rome see Wine in Rome a great blog by Tom Maresca.